Condoleezza Rice Details Her Civil-Rights Roots In New Memoir Former Secretary of State Condoleezza Rice has witnessed seminal events in U.S. history, from growing up in segregated Alabama to helping plan the U.S. invasions of Iraq and Afghanistan. Her new memoir describes how her parents helped her reach the White House. 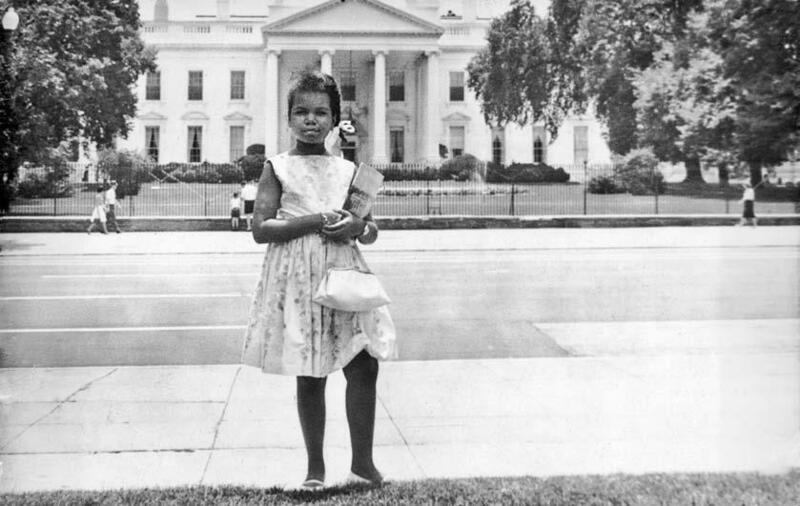 Condoleezza Rice stands in front of the White House during a family trip to Washington, D.C. Rice says her parents had her convinced "that even if I couldn't have a hamburger at Woolworth's lunch counter, I could grow up to be president of the United States." The life of former Secretary of State Condoleezza Rice is anchored by seminal events in U.S. history, from her youth in segregated Alabama to helping plan the U.S. invasions of Iraq and Afghanistan. That life arc might strike some as unlikely -- and Rice says that when people ask her how she traveled from the civil rights era to the White House, she points to her parents. "I always say, you had to know John and Angelena Rice," she tells NPR's Renee Montagne. "So, this is really their story, and my life wrapped in their story." 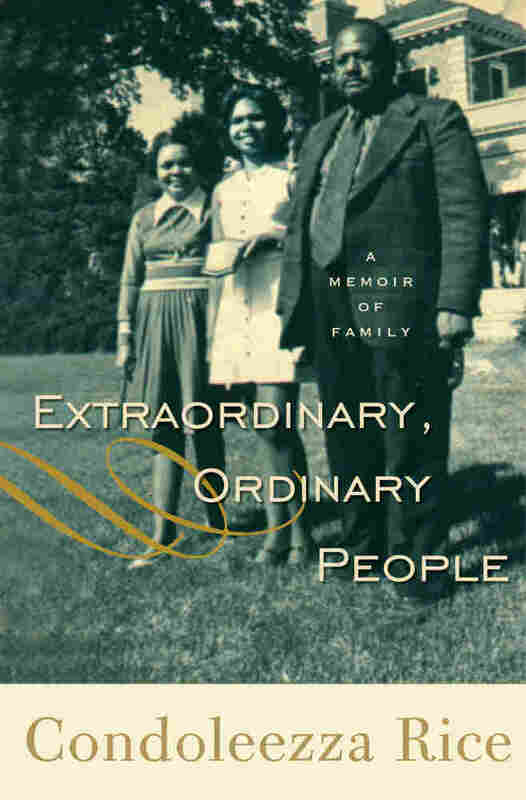 Rice tells those stories in her new book, Extraordinary, Ordinary People, the first half of a planned two-book memoir. The book is a deeply personal account of growing up under segregation in Birmingham, Ala., where the threat of violence was never far away. But its dominant theme is the influence of Rice's parents, who were committed educators. Her father was also the minister of a well-respected Presbyterian church. Rice says that as a girl, she was expected to take on any educational opportunity that arose. "I would even say that my parents, and their friends in our community, thought of education as a kind of armor against racism," she says. "If you were well-educated and you spoke well, then there was only so much 'they' could do to you." In this case, the "they" were white racists, Rice says. Even with a strong education, "you had to be twice as good to be accepted," Rice says. But even in an unfair climate, Rice was taught not to be a victim. "That was a sin," she says, "to consider yourself victimized, or not able to control your destiny, or your fate -- that was the one cardinal sin in our community." In her book, Rice describes Birmingham of that era as "eclipsing every other big American city in the ugliness of its racism." "The rigorous academics at St. Mary's Academy prepared me well for college," Rice writes. 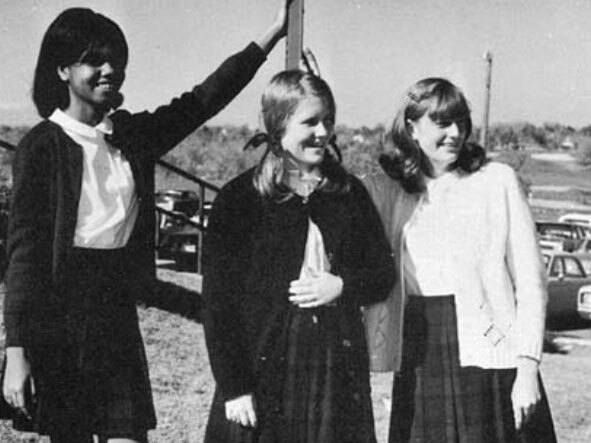 "Life also revolved around trying to attract the boys at our brother schools, Mullen Prep and Regis High." For instance, Rice recalls that the presence of police was a bad sign -- and often a dangerous one. The situation "exploded" in 1963, she says, with riots, police abuse -- and the bombing of the 16th Street Baptist Church in September, when four young girls were killed. One of them, Denise McNair, was just a few years older than Rice, and had been a playmate of hers. "And if you were a child in Birmingham, you knew then that this was not a safe place," she says. Even a childhood visit to see Santa Claus could become a racially charged event, Rice says. As the Rice family waited in line, her father, John, noticed that the white man portraying Santa was keeping black kids at arm's length, while putting white children on his knee. Rice recalls her father saying, "If he does that to Condoleezza, I'm going to pull all that stuff off him, and just expose him as the cracker that he is." "I sort of went forward with a lot of trepidation," she says. "I wasn't really sure who was going to go off here -- Santa Claus or Daddy. My dad was a big man -- he was 6 foot 2 and built like a football player." Luckily for all involved, Santa plopped young Condoleezza onto his knee and asked her what she wanted for Christmas. Rice's parents did not march in the various civil rights rallies taking place in Birmingham. Instead, Rice says, they did other things to show their support -- like boycotting certain stores and refusing to give student protesters' names to state authorities. Rice says she overheard her parents discussing the marches, and John Rice's decision to stay away. "My father was very clear about why he wouldn't [march]," Rice says. "My dad was not someone who you would strike with a billy club and he wouldn't strike back. It just wasn't in him." 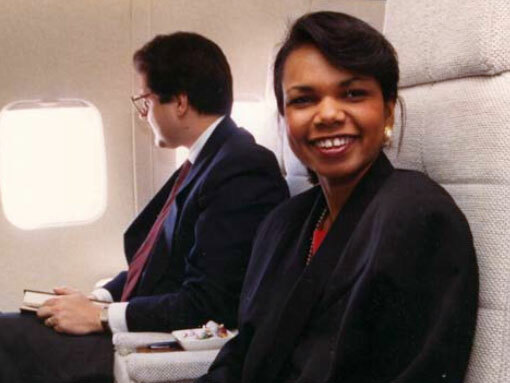 Rice's first flight aboard Air Force One was in April 1989 while working for President George H.W. Bush. Rice remembers her parents' conversation this way: "They would have hit him -- meaning, the police. He would have fought back ... and his daughter would have been an orphan." In the months since she's written the book, Rice says, she's been surprised by the number of people who hadn't realized how fully places like Birmingham were defined by racism and segregation in the 1960s. "Maybe that's a good story for people to know," she says. My parents were anxious to give me a head start in life -- perhaps a little too anxious. My first memory of confronting them and in a way declaring my independence was a conversation concerning their ill-conceived attempt to send me to first grade at the ripe age of three. My mother was teaching at Fairfield Industrial High School in Alabama, and the idea was to enroll me in the elementary school located on the same campus. I don't know how they talked the principal into going along, but sure enough, on the first day of school in September 1958, my mother took me by the hand and walked me into Mrs. Jones' classroom. I was terrified of the other children and of Mrs. Jones, and I refused to stay. Each day we would repeat the scene, and each day my father would have to pick me up and take me to my grandmother's house, where I would stay until the school day ended. Finally I told my mother that I didn't want to go back because the teacher wore the same skirt every morning. I am sure this was not literally true. Perhaps I somehow already understood that my mother believed in good grooming and appropriate attire. Anyway, the logic of my argument aside, Mother and Daddy got the point and abandoned their attempt at really early childhood education. I now think back on that time and laugh. John and Angelena were prepared to try just about anything -- or to let me try just about anything -- that could be called an educational opportunity. They were convinced that education was a kind of armor shielding me against everything -- even the deep racism in Birmingham and across America. They were bred to those views. They were both born in the South at the height of segregation and racial prejudice -- Mother just outside of Birmingham, Alabama, in 1924 and Daddy in Baton Rouge, Louisiana, in 1923. They were teenagers during the Great Depression, old enough to remember but too young to adopt the overly cautious financial habits of their parents. They were of the first generation of middle-class blacks to attend historically black colleges -- institutions that previously had been for the children of the black elite. And like so many of their peers, they rigorously controlled their environment to preserve their dignity and their pride. Objectively, white people had all the power and blacks had none. "The White Man," as my parents called "them," controlled politics and the economy. This depersonalized collective noun spoke to the fact that my parents and their friends had few inter-actions with whites that were truly personal. In his wonderful book Colored People, Harvard professor Henry Louis "Skip" Gates Jr. recalled that his family and friends in West Virginia addressed white people by their professions -- for example, "Mr. Policeman" or "Mr. Milkman." Black folks in Birmingham didn't even have that much contact. It was just "The White Man." Certainly, in any confrontation with a white person in Alabama you were bound to lose. But my parents believed that you could alter that equation through education, hard work, perfectly spoken English, and an appreciation for the "finer things" in "their" culture. If you were twice as good as they were, "they" might not like you but "they" had to respect you. One could find space for a fulfilling and productive life. There was nothing worse than being a helpless victim of your circumstances. My parents were determined to avoid that station in life. Needless to say, they were even more determined that I not end up that way. My parents were not blue bloods. Yes, there were blue bloods who were black. These were the families that had emerged during Reconstruction, many of whose patriarchs had been freed well before slavery ended. Those families had bloodlines going back to black lawyers and doctors of the late nineteenth century; some of their ancestral lines even included political figures such as Hiram Rhodes Revels, the first black United States senator. There were pockets of these families in the Northeast and a large colony in Chicago. Some had attended Ivy League schools, but others, particularly those from the South, sent their children to such respected institutions as Meharry Medical College, Fisk, Morehouse, Spelman, and the Tuskegee Institute. In some cases these families had been college-educated for several generations. My mother's family was not from this caste, though it was more patrician than my father's. Mattie Lula Parrom, my maternal grandmother, was the daughter of a high-ranking official, perhaps a bishop, in the African Methodist Episcopal Church. Though details about her father, my great-grandfather, are sketchy, he was able to provide my grandmother with a first-rate education for a "colored" girl of that time. She was sent to a kind of finishing school called St. Mark's Academy and was taught to play the piano by a European man who had come from -Vienna. Grandmother had rich brown skin and very high cheekbones, exposing American Indian blood that was obvious, if ill-defined. She was deeply religious, unfailingly trusting in God, and cultured. My grandfather Albert Robinson Ray III was one of six siblings, extremely fair-skinned and possibly the product of a white father and black mother. His sister Nancy had light eyes and auburn hair. There was also apparently an Italian branch of the family on his mother's side, memorialized in the names of successive generations. There are several Altos; my mother and her grandmother were named Angelena; my aunt was named Genoa (though, as southerners, we call her "Gen-OH-a"); my cousin is Lativia; and I am Condoleezza, all attesting to that part of our heritage. Granddaddy Ray's story is a bit difficult to tie down because he ran away from home when he was thirteen and did not reconnect with his family until he was an adult. According to family lore, Granddaddy used a tire iron to beat a white man who had assaulted his sister. Fearing for his life, he ran away and, later, found himself sitting in a train station with one token in his pocket in the wee hours of the morning. Many years later, Granddaddy would say that the sound of a train made him feel lonely. His last words before he died were to my mother. "Angelena," he said, "we're on this train alone." In any case, as Granddaddy sat alone in that station, a white man came over and asked what he was doing there at that hour of the night. For reasons that are not entirely clear, "Old Man Wheeler," as he was known in our family, took my grandfather home and raised him with his sons. I remember very well going to my grandmother's house in 1965 to tell her that Granddaddy had passed away at the hospital. She wailed and soon said, "Somebody call the Wheeler boys." One came over to the house immediately. They were obviously just like family. I've always been struck by this story because it speaks to the complicated history of blacks and whites in America. We came to this country as founding populations --Europeans and Africans. Our bloodlines have crossed and been intertwined by the ugly, sexual exploitation that was very much a part of slavery. Even in the depths of segregation, blacks and whites lived very close to one another. There are the familiar stories of black nannies who were "a part of the family," raising the wealthy white children for whom they cared. But there are also inexplicable stories like that of my grandfather and the Wheelers. We still have a lot of trouble with the truth of how tangled our family histories are. These legacies are painful and remind us of America's birth defect: slavery. I remember all the fuss about Thomas Jefferson and Sally Hemings a few years back. Are we kidding? I thought. Of course Jefferson had black children. I can also remember being asked how I felt when I learned that I apparently had two white great-grandfathers, one on each side of the family. I just considered it a fact -- no feelings were necessary. We all have white ancestors, and some whites have black ancestors. Once at a Stanford football game, my father and I sat in front of a white man who reached out his hand and said, "My name is Rice too. And I'm from the South." The man blanched when my father suggested we might be related. It is just easier not to talk about all of this or to obscure it with the term "African American," which recalls the immigration narrative. There are groups such as Mexican Americans, Korean Americans, and German Americans who retain a direct link to their immigrant ancestors. But the fact is that only a portion of those with black skin are direct descendants of African immigrants as is President Obama, who was born of a white American mother and a Kenyan father. There is a second narrative, which involves immigrants from the West Indies such as Colin Powell's parents. And what of the descendants of slaves in the old Confederacy? I prefer "black" and "white." These terms are starker and remind us that the first Europeans and the first Africans came to this country together -- the Africans in chains. 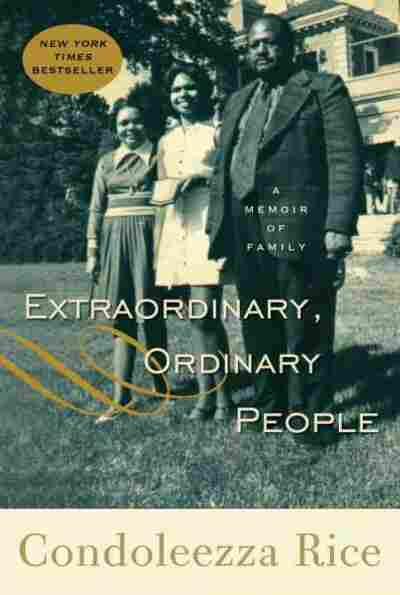 Excerpted from Extraordinary, Ordinary People: A Memoir Of Familiar by Condoleezza Rice. Copyright 2010 by Condoleezza Rice. Reprinted by permission of Random House, Inc.